This week StogieGuys.com is in Orlando covering the 80th annual International Premium Cigar & Pipe Retailers (IPCPR) Association Trade Show—the convention where cigar makers from around the world come to showcase their products and debut new creations. Check back throughout the day for updates, and keep an eye on Twitter for even more. Friday Early Morning: Yesterday, I sat in on the seminars IPCPR holds before the Trade Show officially opens this morning. First up was the CRA/IPCPR Cigar Politics seminar. Unfortunately, attendance was sparse compared to later sessions, in part because it was the first one of the day. I’d estimate 200 people attended. The big news announced there was that Senator Bob Casey (D-PA) would be signing on as a sponsor of Senate Bill 1461 to protect cigars (and the jobs in the cigar industry) from FDA regulation. While it took him a while to get on board with the bill, his support makes plenty of sense given the number of major retailers (Cigars International, Famous Smoke Shop, Holts, etc…) based in the state. At the Cigarnival festival in Easton, Pennsylvania, held just over a month ago, attendees were encouraged to contact Senator Casey. That personal contact from his constituents apparently worked. 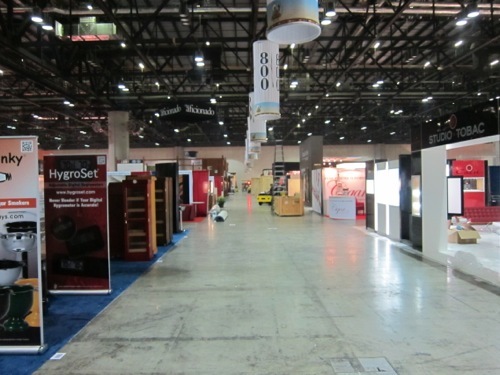 Friday AM: In addition to the seminars, yesterday I went on the show floor as setup was taking place. Seeing the booths makes it clear how much time, effort, and money goes into the show. Some of the setups are literally as complicated as building a small house (and can cost just as much). It reminds you that, at the core, manufacturers are here to make sales that justify the extraordinary cost. Friday Midday: As Chris Edge told us in our recent interview, he is focusing on relaunching Dona Flor into the American market. Still, Alonso Menendez (a cigar we thought very highly of when it first hit the US market seven years ago) is available for those who ask for it. Further, Chris tells us he will soon be releasing a special Alonson Menendez to celebrate the 35th Anniversary of the brand. Friday Midday: Erneto Perez-Carrillo showed us his newest line Inch, featuring large ring gauges and using a high priming Ecuadorian Sumatra wrapper. The blend, he tells us, uses original Dominican piloto cubano seed tobacco that reminds him of some of the stuff he used when he first launched El Credito in Miami. He also shared with us a new blend he’s working on that so far doesn’t have a name and will come out in October. In addition, a new annual edition is due out in November. Friday Midday: Sean Williams of El Primer Mundo is focusing on promoting his new line Hermandad, made in the Dominican Republic at Abe Flores’ (Of Pinar Del Rio) factory. The blend uses a Brazilian Arapiraca wrapper with Nicaraguan binder and filler. Sean also shared with us his new Clase Reserva cigar, which features a San Andreas wrapper around Nicaraguan binder and filler. 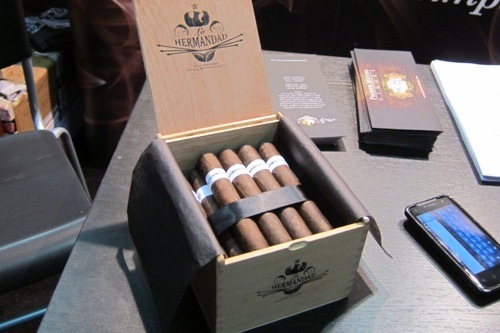 The cigar is made at El Titan de Bronze in Miami and is limited to 1,200 boxes of 12. 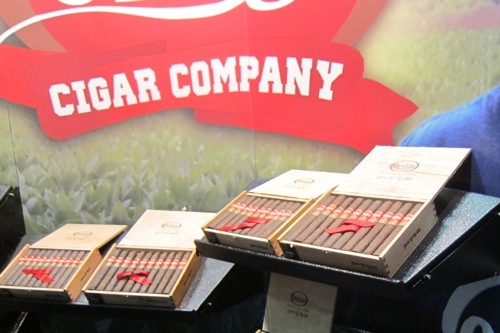 Friday Midday: Eddie Ortega of Ortega Cigar Company said he’s been pleased with how his brand has grown so far – based on the feedback on the Series D, which is available in both Maduro and Natural now. He said coming into the show, his cigars are available in around 150 stores nationwide. He also mentioned two new releases he working on. “The Brotherhood” – which Ortega hopes will be ready in the next few months – will be a cigar where a portion of profits are donated to Wounded Warriors. He’s also working on “Ortega’s Dirty Dozen” that will be a series of 12 limited releases each with its own personality, size and blend. I asked him if he’ll be making these with Pepin (like his Series D line and his previous 601 cigars), and he said that he plans to work with others too, to diversify his lines’ flavor profile. Friday Afternoon: General Cigar was busy as always, with quite a few notable new releases. 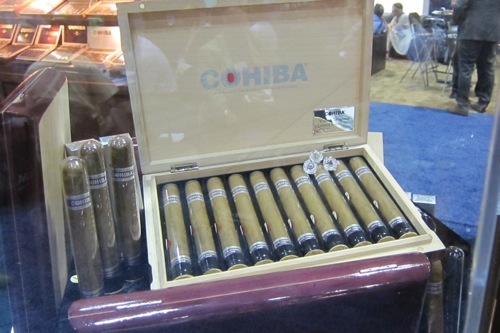 On the high end is the Cohiba Ediciòn Diamante ($22 and $25 for the two sizes – 5″ x 50 and 6″ x 54 – respectively). The cigar uses a Cameroon wrapper from 1980 (with a Indonesian binder and Dominican Piloto Cubano filler) and comes in boxes of 10, with 2012 boxes of each made. Another new cigar from General is the new Macanudo Vintage 2006, which uses Connecticut Habano and San Augustine double binders, and was described as the strongest Macanudo vintage release to date. It will hit shops in November and will cost $8.40-$9 each. Friday Afternoon: General Cigar introduced the second CAO line since the company fully joined the General Cigar family. “Concert” is designed to celebrate the brand’s Nashville roots, and the city’s rich music tradition, hence the limited edition working speaker humidors seen in the photo above. The blend is based on the “C” blend from the Last Stick Standing promotion, but Ricky Rodriguez, the “bro” primarily responsible for the CAO blends, tells me there were 15 different variations of that blend before they ended up with the final Concert blend. Interestingly, Concert comes in four sizes that are all 5.5 inches in length, with four different ring gauges (46, 50, 54, and 60). 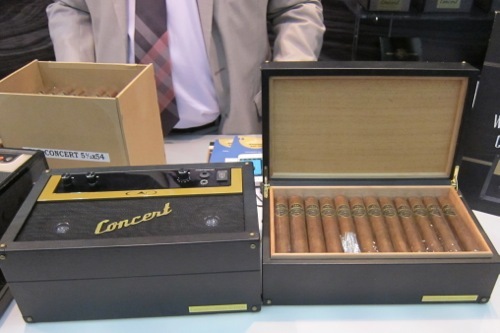 The cigars will launch with a 30-event tour starting in September (where the working amp humidors will be given away), and will sell for $5.75-7.50 per cigar. Friday Afternoon: Erik Espinosa (formerly the “E” of “EO Brands”) had a booth set up that had some familiar cigars including some new ones. Just three weeks ago, Espinosa finalized a deal to take the 601 and Murcielago lines back, after Rocky Patel bought a 50% share in the company a few years ago. Espinosa is also launching the new “Espinosa”cigar featuring an Ecuadorian Habano wrapper with Nicaraguan binder and filler, as well as “La Zona,” a new value-priced stick. The new cigars as well as the 601 brands will all be made at Espinosa’s new La Zona Factory in Estelí (previously, the 601 lines were made at Pepin’s My Father Cigars factory). Erik says he is working to ensure that the 601 blends don’t change, even as they move to the new factory. A maduro version of Espinosa is in the works, but at least a few months off. Friday Evening: It was a busy first day on the show floor for us, going from booth to booth. We hit far more than just those booths listed above (nearly 20 all told), but since StogieGuys.com is only on the floor Friday and Saturday, a lot of the information we got will have to come tomorrow or later this week in a followup article. Tonight there are a plethora of cigar parties and events taking place. 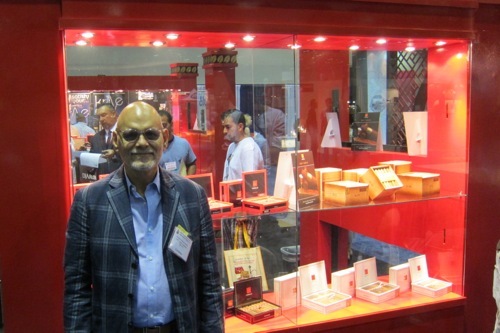 Meanwhile, continue to check our Twitter feed and stop by tomorrow for more coverage, including George E’s impressions from his first Trade Show. Check back throughout the day today and tomorrow for live updates from the Trade Show floor as we get the skinny on new products. And feel free to leave a comment on this post if you have a question you’d like us to ask a cigar maker. 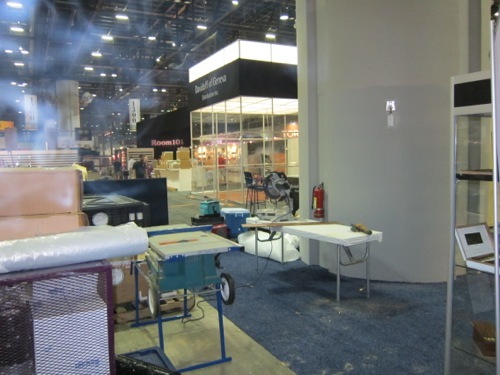 You can read our previous 2012 Trade Show coverage here, here, and here. It looks like the IPCPR seminar attendees are smoking in the convention center's meeting rooms? How did they get the OK to do that? I thought Florida's smoking ban had ended smoking in the convenrtion center — and that was partly why they had not brought the show to Florida in years. Unless I'm mistaken, Orlando issued a special exemption to allow smoking on the Trade Show floor for the IPCPR event in order to attract the convention business to Orlando. My colleague who is actually in Orlando today, Patrick S, can probably elaborate. If that's true, good for them. But I am surprised — Florida'svoter-approved smoking ban is in the state constitution, and I didn't think it had a trade show exemption. Maybe they used the exemption for tobacco shops. Sorry I didn't see this until after I'd returned from IPCPR. But my assumption is that because the state's regulations have a specific exemption for an "enclosed indoor workplace dedicated to or predominantly for the retail sale of tobacco, tobacco products, and accessories for such products," they simply allowed that portion of the convention center where IPCPR is being held to be designated as such while the convention is under way. I have to say, I'm really excited for Dona Flor's stuff to come in. It really looks like they're not cutting any corners just to get back in the market.